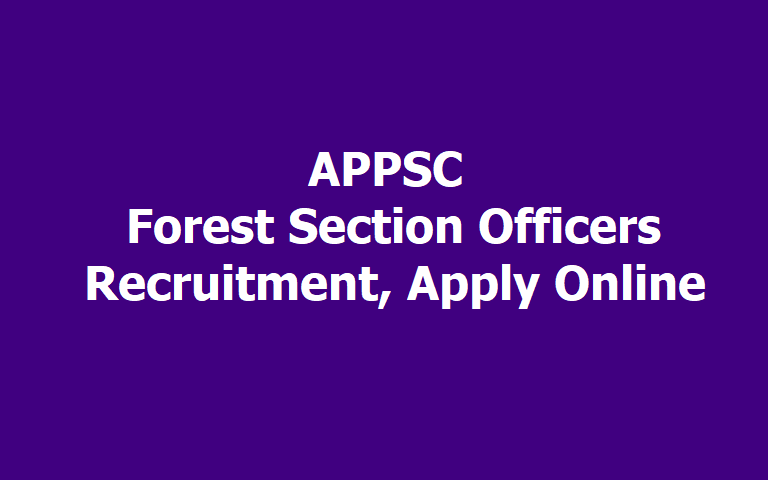 APPSC Forest Section Officers(FSOs) Recruitment 2019, Apply Online: Andhra Pradesh State Public Service Commission (APPSC) has recently issued a notification for the recruitment of Forest Section Officers in the Forest Department (EFS&T) of the state on its official website. Interested candidates need to apply online for the examination (objective test) that is likely to be held in June and August. The application process begins on February 26 and will close on march 20, 2019. The hall ticket for the examination will be available for download a week before the commencement of examination. A candidate applying for the examination should be of minimum 18 years and maximum 31 years as on July 1, 2019. There is age relaxation for SCs, STs, BCs and some other category of candidates. Note: Check details regarding relaxation of age, educational qualification, examination centres and much more in the notification below. ఆంధ్ర‌ప్ర‌దేశ్ అట‌వీ శాఖలో కింది ఉద్యోగాల భర్తీకి ఆంధ్ర‌ప్ర‌దేశ్ ప‌బ్లిక్ స‌ర్వీస్ క‌మిష‌న్ (ఏపీపీఎస్సీ) ద‌ర‌ఖాస్తులు కోరుతోంది. అర్హ‌త‌: బోట‌నీ/ ఫారెస్ట్రీ/ హార్టికల్చ‌ర్‌/ జువాల‌జీ/ ఫిజిక్స్‌/ కెమిస్ట్రీ/ మ్యాథ్స్‌/ స్టాటిస్టిక్స్‌/ జియాల‌జీ/ అగ్రిక‌ల్చ‌ర్ స‌బ్జెక్టుల్లో ఒక స‌బ్జెక్టుగా బ్యాచిల‌ర్ డిగ్రీ లేదా కెమిక‌ల్/ మెకానిక‌ల్‌/ సివిల్‌ ఇంజినీరింగ్‌లో బ్యాచిల‌ర్ డిగ్రీతో పాటు నిర్దిష్ట శారీర‌క ప్ర‌మాణాలు త‌ప్ప‌నిస‌రి. వ‌య‌సు: 18 నుంచి 30 ఏళ్ల మ‌ధ్య ఉండాలి..
FSO: Must possess a Bachelor's Degree in Botany or Forestry or Horticulture or Zoology or Physics or Chemistry or Mathematics or Statistics or Geology or Agriculture as a subject or a Bachelor's degree in Engineering with Chemical Engineering or Mechanical Engineering or Civil Engineering of any University of India, established or incorporated by or under a Central Act, State Act or Provincial Act or an Institution recognized by the University Grants Commission or an equivalent qualification. c) Provided further that in the case of candidates belonging to the Scheduled Tribes, where the reserved quota cannot be fully utilized for want of sufficient number of candidates possessing the requisite Physical Qualifications, the physical standards shall not be less than 158 cms. in height and not less than 78.8 cms. round the chest on full inspiration with a minimum expansion of 5 cms. Weightage shall be given to the NCC certificate Holders having requisite qualifications, physical measurements at the time of selection, as follows. NCC – “C” Certificate holder – 5 bonus marks. NCC – “B” Certificate holder – 3 bonus marks. No person shall be eligible for direct recruitment if he/she is not less than 18 years of age and if he / she is more than 30 years of age as on 01/07/2019 as per G.O.Ms.No.8 General Administration (Ser-A) Dept., dated: 24.01.2019. Candidates should not be born earlier than 2nd July 1989 and not later than 1st July 2001.
a)FEE: (Remittance of Fee) Each applicant must pay Rs. 250/- towards Online Application Processing Fee. This apart, the applicants have to pay RS. 120/- towards Examination Fee. However, the following category of candidates are exempted from payment of Examination fee. b) Unemployed applicants in the age group of 18 to 31 years of AP State (They have to submit declaration at an appropriate time to the Commission that they are unemployed). rejection of application. The list of Banks providing service for the purpose of online remittance of fee is given in ANNEXURE – II. 11) PDF application will be generated which contains the particulars furnished by the candidates. Note: The ID No in the PDF application form has to be quoted for future reference/correspondence. application if not registered earlier to obtain APPSC ID. While filling the same, the candidates have to ensure that there are no mistakes in it. The Commission bears no responsibility for the mistakes, if any, made by the candidates. Application and Click on the Link with Notification Number and Name, provide APPSC ID and Date of Birth to proceed further. displayed or need to be changed, he/she should click No on confirm button. If details are not displayed a text box will open and candidate has to feed the details manually. the details obtained from OTR database, Notification specific details such as Examination Centre opted, required qualification, university details, eligibility and accepting declarations etc. are to be filled by the candidate. Preview and Edit facility is available to make changes and submit for proceeding to Next step of making online payment of fee. be quoted for future reference/correspondence. any changes are made by the candidate to OTR database at a later date will not be considered for the purpose of this Notification. iii) The applicants should be willing to serve anywhere in AP State. Before applying for the posts, candidates shall register themselves as per the One Time Registration (OTR) through the Official Website of APPSC. Those who have registered in OTR already shall apply by login to their profile using their APPSC ID and Date of Birth as provided in OTR.